The final day of action at the Laoshan velodrome saw more extaordinary performances from Britain’s cyclists, and some extraordinary people in the stands cheering them on. With the events of the British cyclists over the last few days grabbing such attention it’s no surprise that the velodrome was the place to be. Formula One supremo Bernie Ecclestone came to watch the Madison, while Princess Anne and Tony Blair stayed to the end to cheer on Chris Hoy and Victoria Pendleton. The former PM did however admit to not having a clue as to what was going on in the Madison race, but the format of the sprints is always a winner. Hoy and Pendleton delivered the cycling teams seventh and eighth medals and strengthened Great Britain’s incredible third spot in the medal table. “The fact is we’ve had a really good Olympic Games, and we can do even better the next time, that’s what we’re aiming for in London,” Blair said. 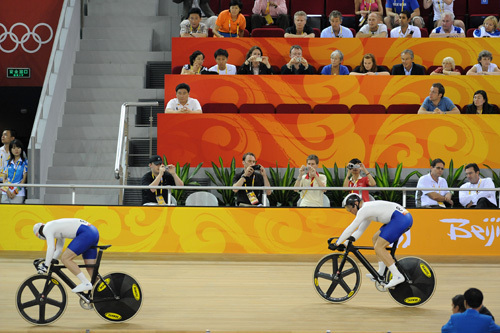 Former Prime Minister Tony Blair watches Jason Kenny as the young Brit watches Chris Hoy. 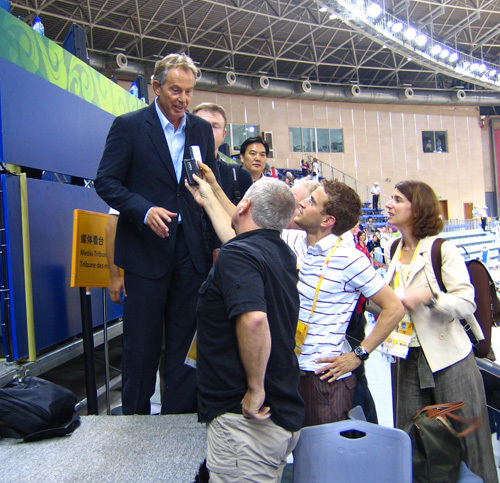 Tony Blair gets to meet Cycling Weekly’s Deputy Editor.